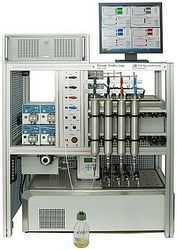 DySL - Stress-Test of Oilfield Chemicals : The Dynamic Stability Loop (DySL) is designed for testing oilfield chemicals on long term stability under most rigorous conditions in laboratory. The DySL combines multi-loop testing of viscosity and filter blocking tests for low and high temperature under pressurized conditions. In respect to extensive testing demands, the DySL is specially designed for multiple loop test runs.It comprises up to 6 test loops for parallel testing of different alternatives oilfield chemicals or different product types.Each loop is operated seperately Cleaning and refill is possible while other loops are still runnings.